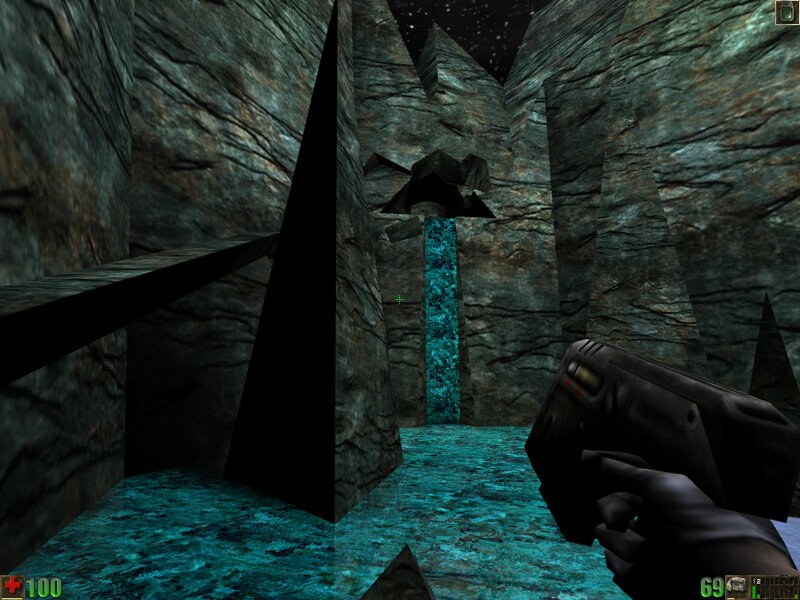 Released in early 2000, Shotdown is the first - and only - level by the czech mapper Kamil Cifrak. It's a shame, really, because the author had potential and it can be seen throughout the map. Still, it never received proper attention and eventually disappeared from the internet altogether. Luckily, the notorious Leo(T.C.K.) had a backup in his stash and agreed to help in re-releasing the map and retranslating it to English since the original English translation by a certain Steven was never recovered. The level's storyline is generic crashdown-on-Na-Pali fare but is implemented quite well. 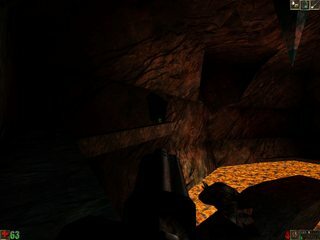 It seems there were three escape pods that crashed on the planet and the player is required to find one of them as well as any potential survivors. The natives have left their mark, albeit a bit stereotypical: there's an overly pious priest, an illiterate villager and another native on the lookout for the Messiah. The underground river turning into a waterfall. Beautiful. The area's architecture is done just right, the oldschool, classic way, albeit at times it's a bit simplistic but there's very little technical issues with it. Amazingly, the lighting is also no eyesore at all, same with the texture layer, despite it being an often-made mistake by first-time mappers. Unlike them, Kamil chose to do things properly and most of the time he succeeded. Also, the visuals are varied: there's a water-filled small canyon, a cave with crude mining/demolition equipment and a village. It's not just good-looking, there's ambience! The place feels alive and can be immersed in - and that is something many other mappers still have difficulty with. The bridge over lava. These stalactites are the key to your survival though. Gameplay is a whole different cup of tea, though. The clever use of triggers and other items of that sort has given us the ability to experience several interesting sequences like falling rock bridges, mining explosives, crushing machinery, siege harpoons (used by the Skaarj to kill off the natives' cattle out of boredom apparently) but for a player looking for pure action it might be a slight turnoff. Like the cave bridge: it took three tries for me to figure out how to pass it (hint: the stalactites and guns make a nice match there) and the crushing machine was a really unpleasant surprise. I had to restart the level with a totally different attitude: less bloodlust, more adventuring spirit and readiness to do some detective work. A very good example on how first-time levels should look like: classic gameplay mixed with a careful dose of innovation. The map is surprisingly high quality work and will provide a couple minutes of decent entertainment. Enjoy. I did. It was nice. I was more surprised that the titan could help you fight off giant mantas. I've just noticed how hungarianisch this guy's name sounds. Great map indeed!